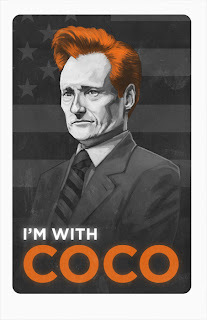 Cim and I are dedicated fans of The Tonight Show with Conan O' Brien. Lately, we have enjoyed watching him rip NBC apart on his shows. Tonight is his last night as the Tonight Show host. What a sad, sad, sad, day. Let us all watch tonight and send the ratings through the roof, only to boycott NBC after he leaves! Just kidding, I have too many favorite shows on NBC to do that. BUT I WILL boycott Jay Leno. Why is he even staying? Seriously. He needs to just retire. He wasn't doing well anyway and this situation will only make it awkward for him to go back to the Tonight Show. Speaking of awkward.... you should watch this clip.